Hello to whoever is still reading this blog…I’ve fallen woefully behind on keeping up with blogging. I checked and it has been nearly 2 months since my last post. I have things to blog about, but for some reason, cannot bring myself to post them. I realized that what makes a blog a “stand-out” blog is a blog that has a specific theme. It gives both the author and the readers clarity about what is being said. It reminds me of two types of people. On the one hand, the people who know a little about a hundred different things. They tend to be “in the know.” On the other hand, the people who know a lot about four things. I feel like this blog has turned into a mishmash of topics with no continuity. I’ve been doing some thinking and haven’t come to a decision point yet, but sometime in the near future, I’m thinking to wrap things up here and start a new, more focused blog. We shall see. In other news…summer seems to have come early to Oregon. I’ve never seen such a warm May. For the most part, I am really enjoying it. Abrielle is nearly 10 months old which I can hardly believe. The biggest thing going on in my life is that I am, for the first time in a looong time, migraine free. !! I have found a solution. I did a one month gluten free food trial which failed. Read about it here. 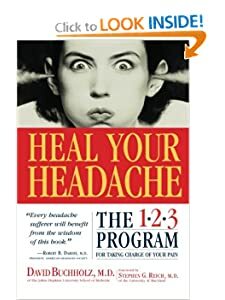 Then while I was looking up migraine supplements to try, I stumbled across this book on Amazon called Heal Your Headache by David Buchholz M.D. and Stephen G. Reich M.D. This book has 388 reviews on Amazon, with 84 percent of them being 5 star reviews. As I started reading through them, I really started to feel hopeful. If you are a migraine sufferer, then you are familiar with the depression and hopeless feeling that can come from dealing with daily pain from a migraine. I borrowed this book from the library and whipped through it. It is a three part program that this book recommends. Step 2 is the most significant: the food elimination diet. This is what I’m finding is working for me. At first I felt like all the fun had gone out of life when I saw the looong list of foods I had to stop eating. Here’s a few of the foods I can’t eat anymore (but not limited to): nuts, cheese, MSG, citrus fruits, avocado, processed meats (anything with nitrates), onions, caffeine, chocolate. The idea is that once you’ve eliminated these foods for a while and gotten rid of the migraines, you can try reintroducing them one at a time and see if you can tolerate them. I saw results with this diet very quickly. It was really hard in the beginning letting go of foods I had been eating regularly, in particular, peanut butter. Peanut butter and me go way back. So far my efforts to reintroduce foods have been unsuccessful and have quickly resulted in migraines, which has been disappointing. But, when I keep to the diet, I don’t have migraines. Plain and simple. And no food is worth having daily migraines. I’ve learned to adapt my diet with some substitutes as well. Sunflower seed butter instead of peanut butter. Cottage cheese instead of sour cream. I’ve learned to make my own sausage by seasoning plain ground pork. I would highly recommend this book if you have chronic headaches or migraines. My cousin is the same exact way! She can’t eat peanuts at all… And my hubby gets migraines when he exerts himself too much in the sun. So he does yardwork later in the day, instead of when the sun is at its hottest. Glad that you are keeping your migraines under control, because they are no fun!